Freeciv.org - open source empire-building strategy game. 22nd Jul 2018 - After over three years, Freeciv 2.6.0 is released. NEWS-2.6.0 describes what's changed since 2.5.x. 13th Jul 2018 - The second release candidate for Freeciv 2.6.0 has been released. 9th Jul 2018 - A new Freeciv-web instance has been launched on isotrident.com. 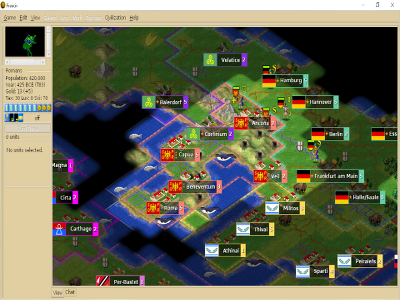 This server has working 2D and 3D single and multiplayer games, play-by-email and all other Freeciv-web features enabled. 30th Jun 2018 - The first release candidate for Freeciv 2.6.0 has been released. 8th Apr 2018 - A group of volunteers has set up a new instance of Freeciv-web on a new server, freecivweb.org. It does not have the user accounts and saved games from play.freeciv.org, and not everything works yet; so far only the Longturn multiplayer game is working. 7th Apr 2018 - The third beta of Freeciv 2.6.0 has been released. 24th Mar 2018 - Freeciv 2.5.11 fixes a regression in 2.5.10: a crash in the Windows build when resizing a dialog. 3rd Mar 2018 - The web version of Freeciv, play.freeciv.org, has been shut down. The sole volunteer who was running the service is no longer willing to continue doing so.